You’ll love these isopod butter cookies. Sweet, savory and buttery. Warm out of the oven, you won’t be able to stop eating them. I’m hooked! Preheat oven to 375 degrees. Grease cookie sheets. Mix together all ingredients until well-blended. Isopods may be live for freshness, but it is not necessary. If you do use live isopods, remember to move quickly, because they will too. Roll 2-inch sized pieces of dough into balls and place on cookie sheet. Flatten each with the back of a fork. Bake 13 to 15 minutes until light brown. Let cool on wire rack. Until now, my isopod recipes have all been using Armadillidium since that is what was easiest for me to start breeding. I would like to start working with Bathynomus, in particular Giant Isopods. I’m starting to make preparations to acquire a stable colony and set up the space to breed them. 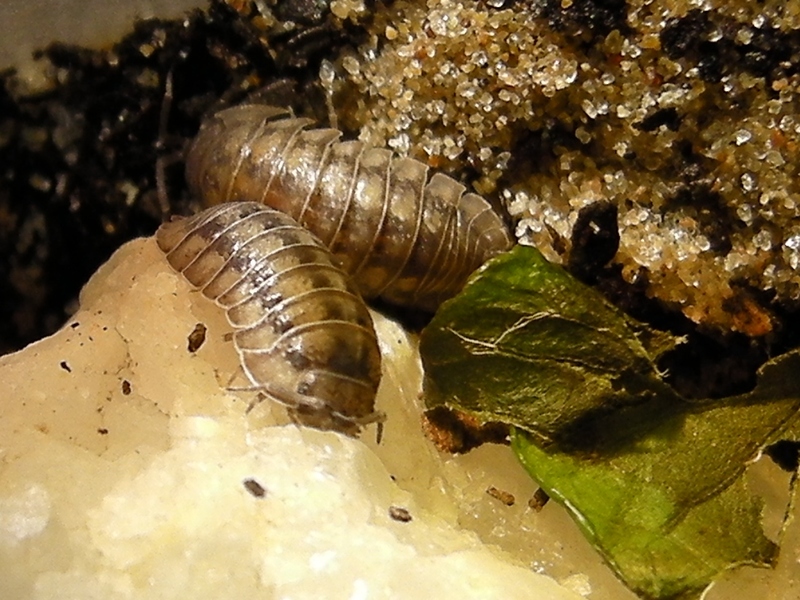 My current isopod tanks (Armadillidium vulgare) have been successful for 8 months. I’ve had some good population growth, despite some mistakes, mishaps, and negligence. 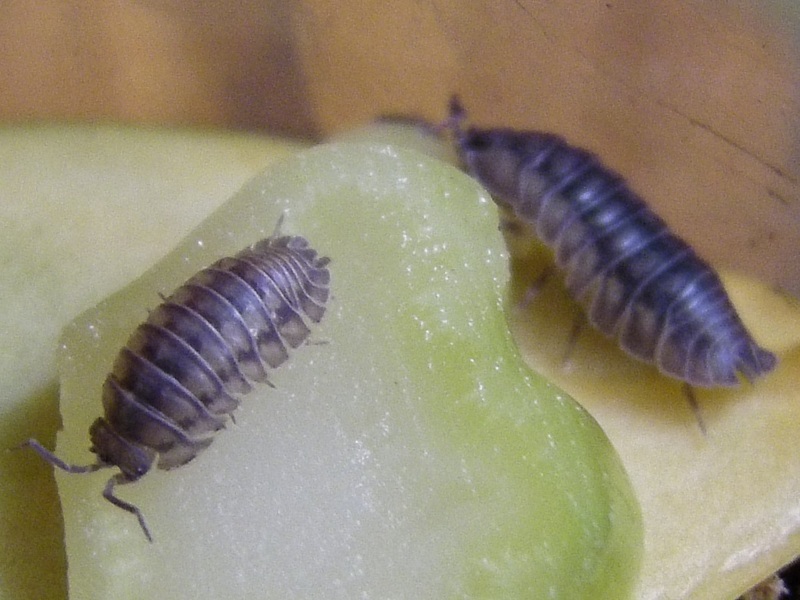 I can say that they eat like nobody’s business, but I’m starting to see isopod tastes. I’ll shred some carrots for them and they just swarm like locusts. And yet they can be finicky eaters in some cases. I’ve left green onions until they decompose and the isopods will still not eat them. It’s just so fascinating to me. I’m excited. Giant isopods and giant isopod recipes coming soon! Ginger is so good for you, and it’s really easy to pickle it at home. I like eating it with chopsticks straight out of the jar until my face burns. Shred the ginger and put into a jar. It won’t look too much like the ginger, or “gari”, you get at sushi restaurants, because most gari has a coloring to make it more of the pinkish color. While I’m at it, I like to squeeze some shredded ginger into kombucha. Do not shake to mix the ginger in. Lightly swirl with chopstick or swirling stick so that kombucha sediment is not disturbed. 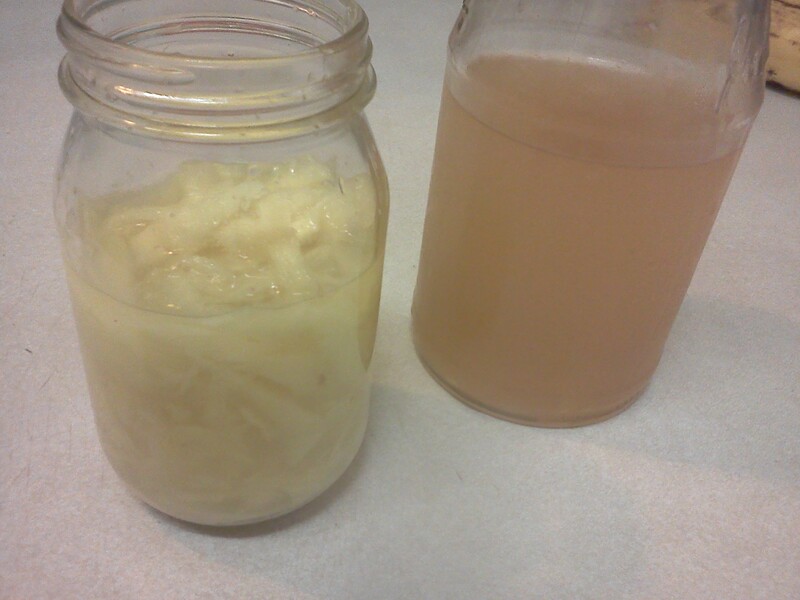 I wasn’t too keen on kombucha until I made ginger kombucha. Now I’m a ginger kombucha fiend! mmm.. hot pb tacos. If only I had pbr to go with them. 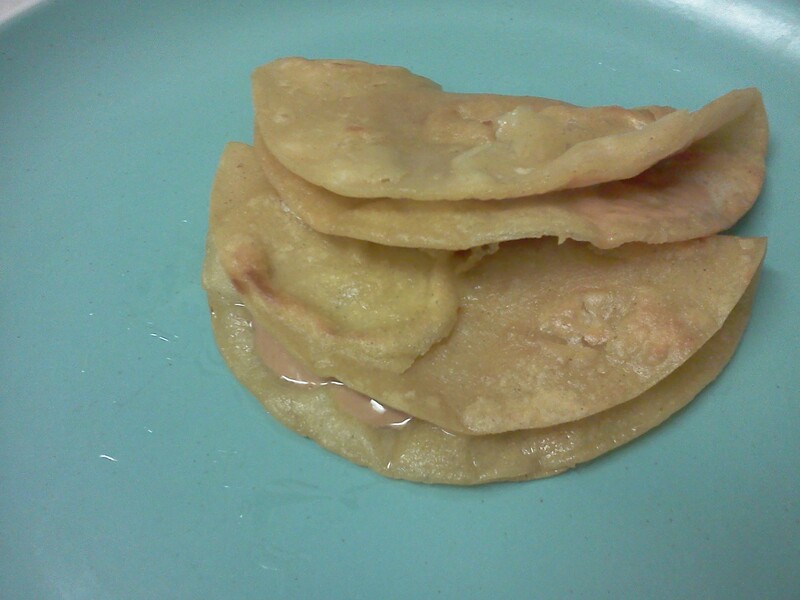 I do love me some fried peanut butter tacos. Check it out. Warm up oil in a pan, add tortilla and flip them around so they get evenly oiled and cooked. Once tortillas are are beginning to brown, fold them while adding peanut butter with a butter knife. Sometimes I make this for a yummy meal. 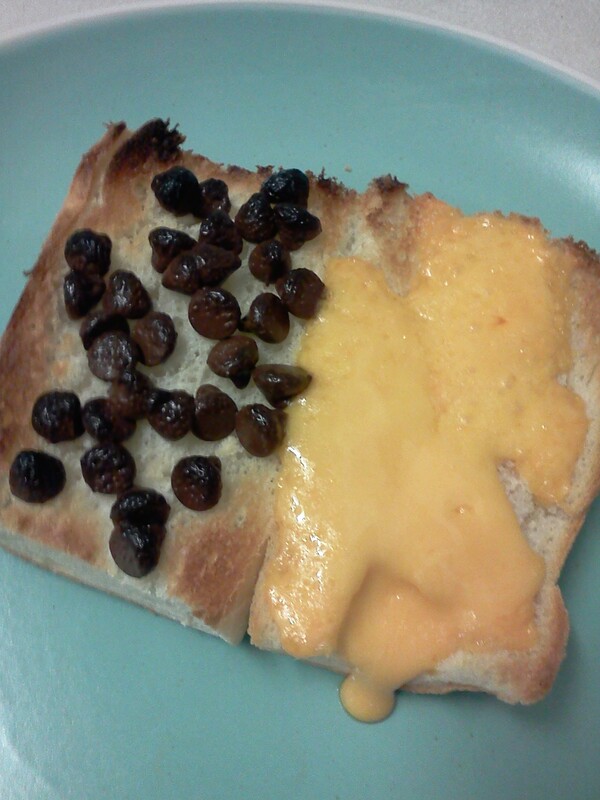 Its a chocolate and cheese sandwich. Cook it in toaster oven at 375 degrees until cheese and chocolate melt. Enjoy your chocolate and cheese sandwich! Don’t eat too many, you’ll get stomach ache. 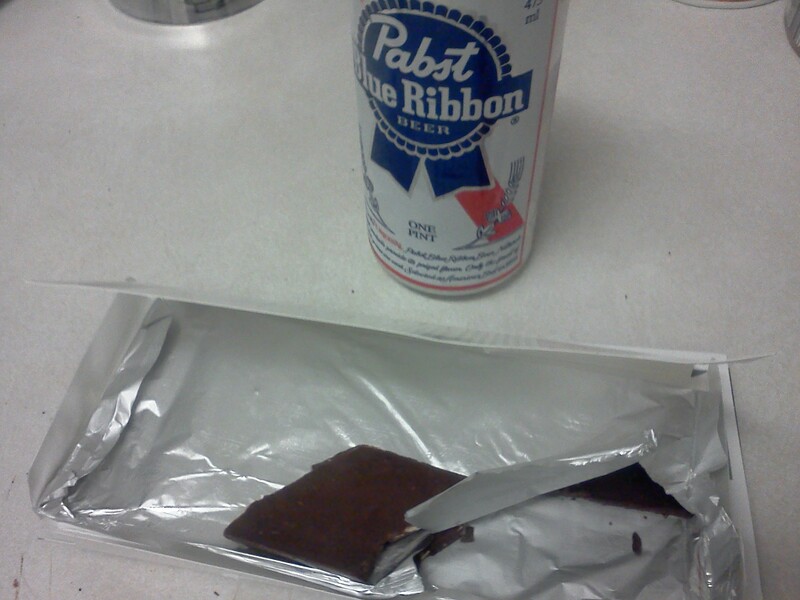 One of my favorite dishes is Chocolate and Beer. It’s just a really easy dinner to make, plus it tastes good too. 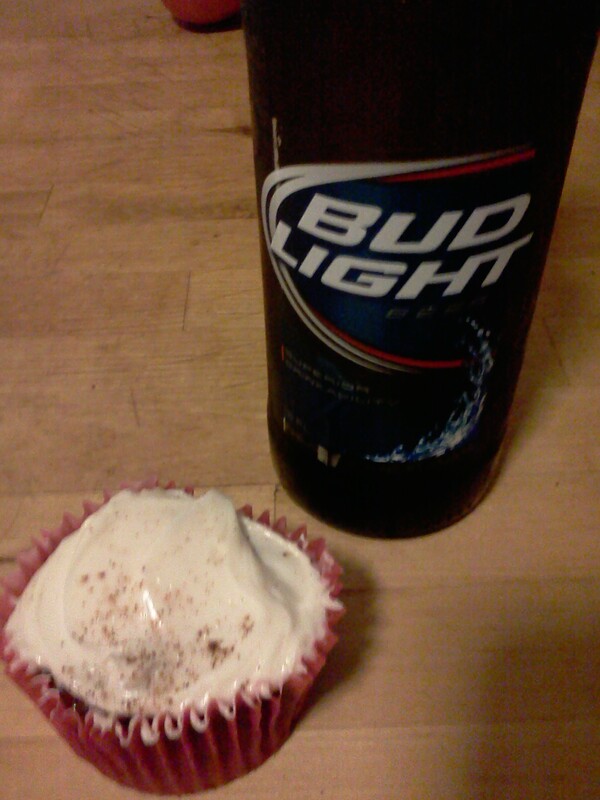 Here I used a chocolate cupcake and free beer. Add as much chocolate and/or beer as needed, and you’re done, dinner is served, and clean up is simple. Makes a good breakfast too! My experimental cooking has gone to new extremes! 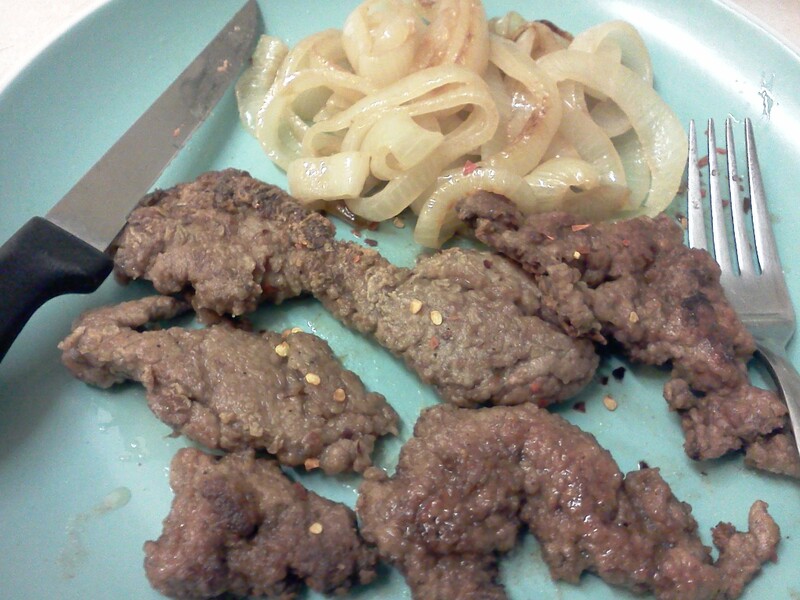 I made Experimental Fried Liver! 🙂 I served it with onions. Rinse liver. Put in a shallow dish. Add milk over liver until its just submerged. Let it soak it in milk for a while. Cut up your onions. Melt 1/4 cup of butter in a pan. Fry your onions until they are golden brown. Put the onions aside. Melt the other 1/2 cup butter in a pan. Mix your flour and seasonings and put in wide bowl or plate. Remove liver from milk, allowing to milk to drain. Roll the liver in the flour. 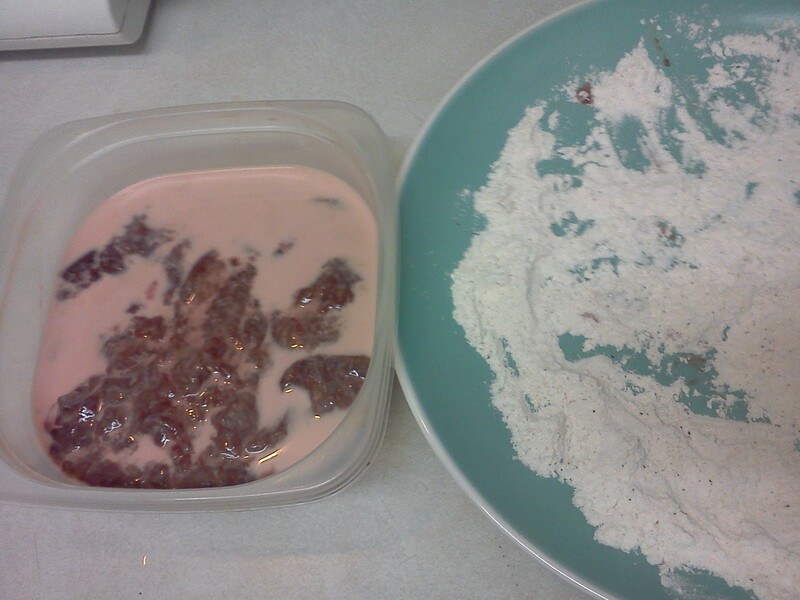 (I messed up my slices through the milk and flour process, which is how they became nuggets.) Add to the pan. Fry the liver until it comes a nice deep brown color.